Poor beets. Often the shunned child because of the “canned beets” stigma and to my mother (sorry mom), a taste that is akin to dirt. I feel that the color alone should reclaim beets from the supermarket shelves and in to fresh produce, but the taste of a roasted beet? Delicious with a hint of sweet. This was an early crop of beets from the hoop house, the biggest beet measuring just larger than a golf ball. Nothing too big, everything just right. I’ve been wanting to make something like this for a while now but when I saw Lakshmi’s Beet Dumplings, I knew it was time. I should also mention that I had a, “I wonder why I should do this moment” when it came to peeling the beets. Unless the skin is tough on any vegetable, I leave it on. After roasting these beets for an hour, I found that the skin was barely there and by the time I pureed everything, I couldn’t even tell. Finally, the mustard sauce was a moment of, “I just got done making homemade mustard, what can I throw it one!” So, if you’re not a big mustard fan, I also think these would be delicious tossed in an herbed browned butter sauce. Scrub beets off and toss with 1 tablespoon of olive oil. 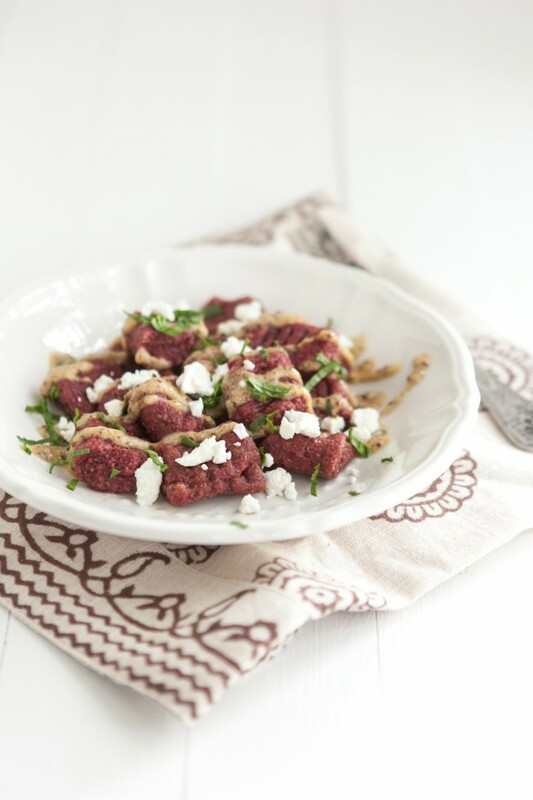 Place in a pan and roast until tender, approximately one hour depending on size of beet. While beets are roasting, make sauce. Pulse garlic in a food processor until in small pieces. Add in mustard, honey, olive oil, and salt. Pulse until sauce is combined, tasting until desired taste is reached. Remove and set aside. Once beets are done, place in a food processor with skin on. 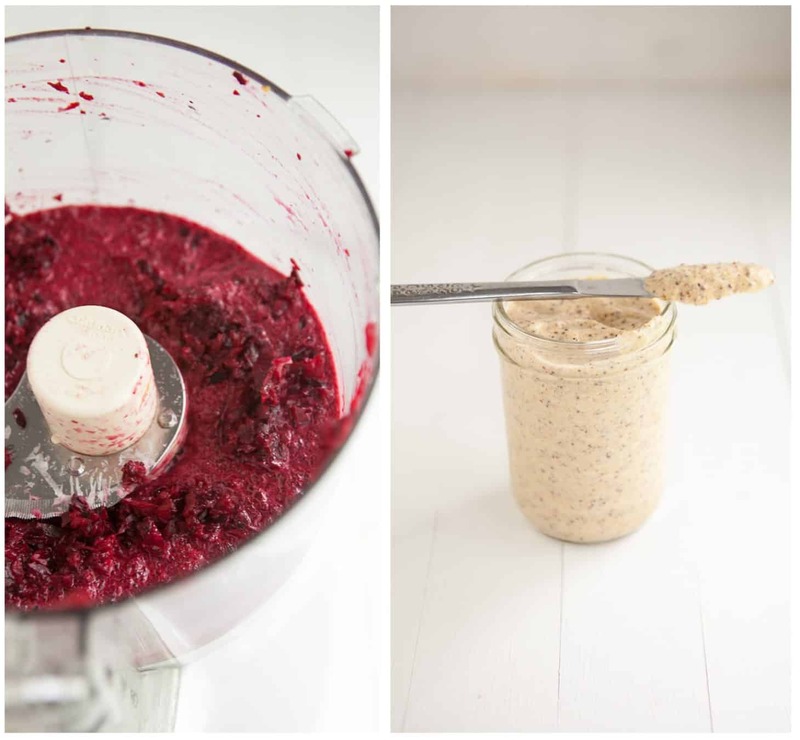 Pulse until beets form a smooth puree. I used approximately 1 cup of the puree and reserved the rest. Stir in salt, parmesan, egg, and 1/2 cup of the flour. Continue to stir and add flour until the mixture forms a soft dough (the dough might be sticky, just use more flour on your hands and surface). Place onto a surface covered in flour. Divide dough into three balls and roll each out into 1″ ropes and cut gnocchi 1″ at a time. Indent gnocchi with the tines of a fork. Repeat with remaining dough. Place gnocchi in a dish, drizzle mustard sauce and goat cheese on top. If you use, you can heat mustard sauce up in a skillet and add gnocchi to lightly fry, then add goat cheese. Serve warm with desired garnish. A couple notes. I made this mustard on the spicier side by using a little over half brown mustard seeds. Obviously, if you make your own with only yellow or buy store bought, the flavor is going to change. Also, I’m really careful when I work with beets as they have been known to stain a few things in my kitchen. What a beautiful colour, this dish is just so full of life and flavour. holy moses this looks good, erin! The gnocchi are beautiful, and I just love that you can leave the skin on. I started to question the need to peel everything, and not doing it when it is not necessary makes life so much easier. Gorgeous. My husband has the same opinion as your mom on beets. More for me. I leave the skin on (nearly) every vegetable – I just clean them very well. It drives my boyfriend crazy, but what’s the point in peeling it off? The gnocchi is beautiful, and I need, need, NEED to find (err, make?) a gluten free alternative. These look amazing Erin. Can’t wait to try them…question….I am gluten free. Do you know which flour I could use instead that would work in place of the pastry flour. I use bob’s redmill all purpose flour and I also have quinoa flour, but not sure if either of these would work. thanks again!! I think you’re all purpose bread mix might work. I didn’t use regular whole wheat flour because I thought it might be a bit too heavy. Maybe try it in a half batch and see how it works? These sound amazing! Yes, please. Probably just my stigma 🙂 But when I think canned, I think actual cans from the grocery store. I’m sure home canned ones are delicious! beets are so underappreciated. this recipe is amazing, thanks for sharing! What a gorgeous dish – if this was on a restaurant menu, I would definitely order it! 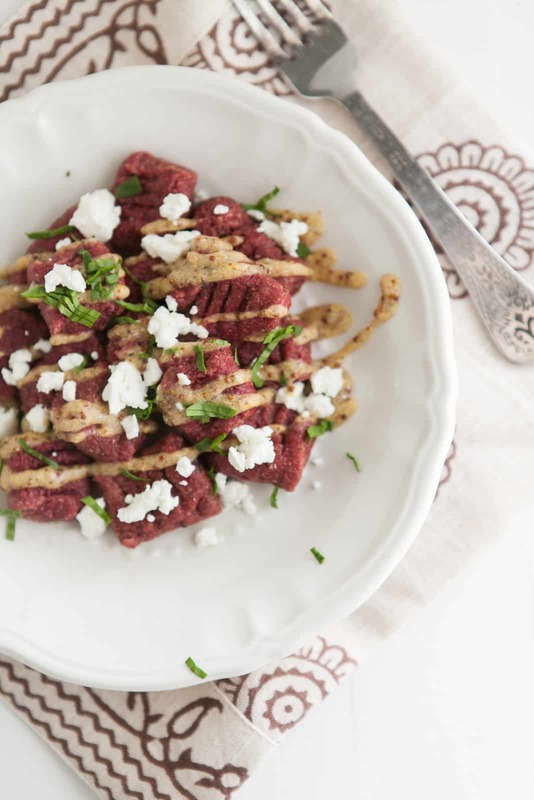 I absolutely love anything made with beets and they pair so well with goat cheese. 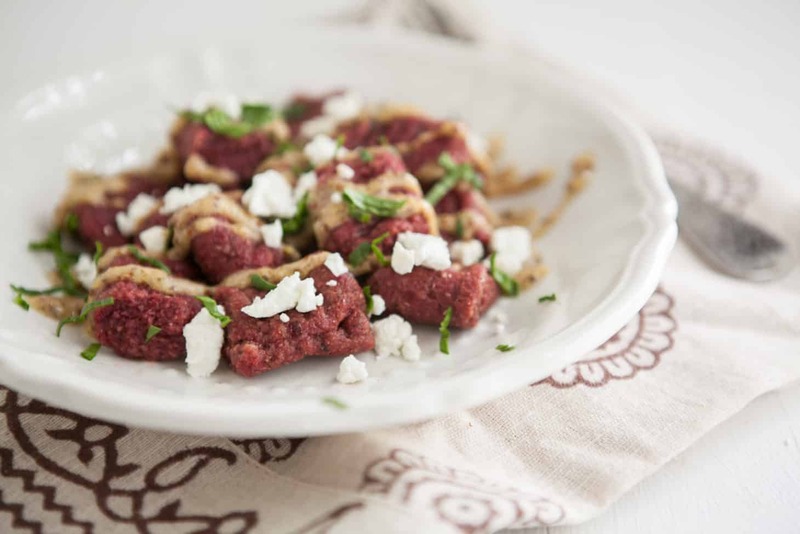 I’ve made pasta with a beet sauce a few times and I love the way the pasta turned bright pink, but I’ve never made the actual pasta itself from beets – I bet that would taste even better! Can I freeze these before I cook them? Or refrigerate? Just to stretch out the recipe. I’ve never tried but I can’t see why not- I would say freezing would be the best best so they don’t dry out! 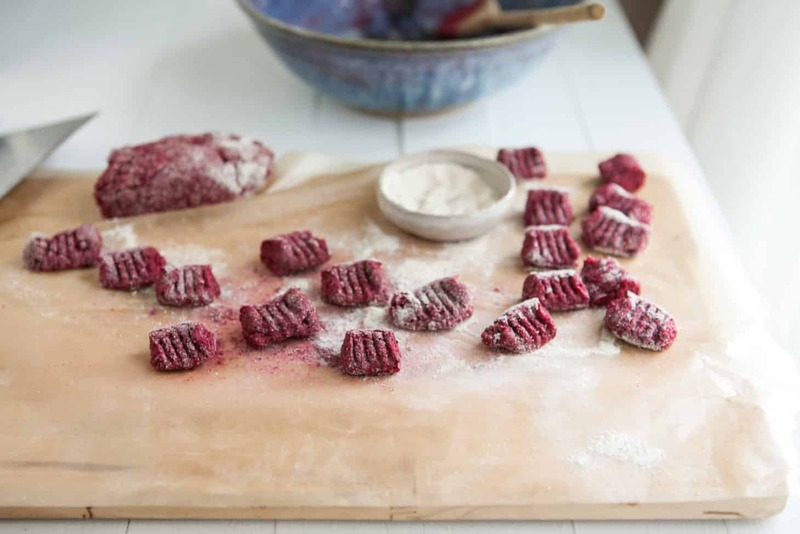 I love beets and I made this gnocchis twice already — both times they came out heavy, and not light as gnocchi are supposed to be. Any idea what I’m doing wrong?! Made this last night – what a wonderful recipe! 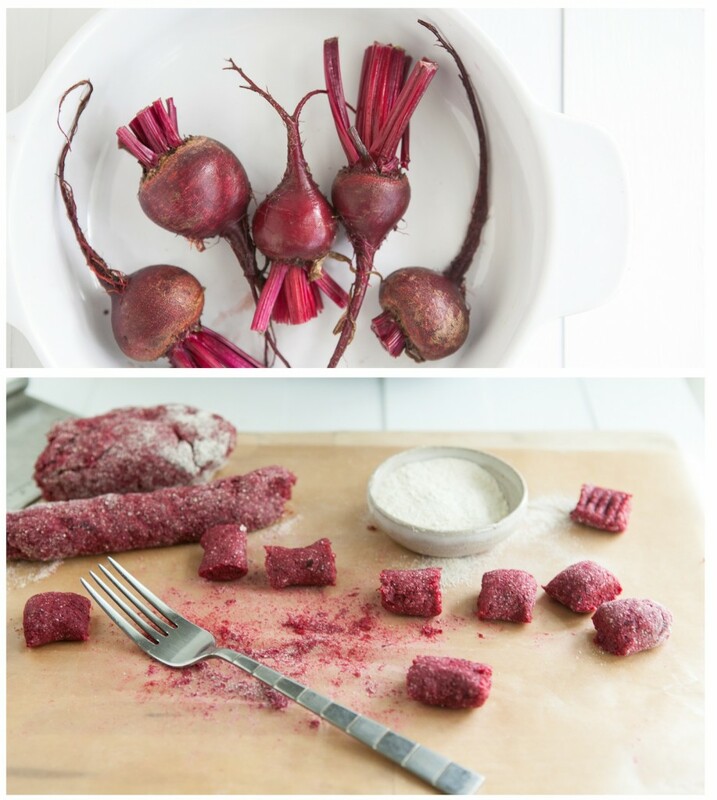 Creative way to use beets, and I love the combination with the mustard sauce! I used feta instead of goat cheese and it still turned out beautifully, thanks! I randomly came across the recipe recently and thought it would be a great way to use the beets that I got in my CSA. Beets and goat cheese are such a great combination and it got me thinking of that beet, goat cheese and baby spinach salad that was on every restaurant’s menu a few years ago. So I added some sautéed spinach and portobellos, and a little balsamic to the mustard sauce, and voila, salad turned pasta dish! Oh, and it was delicious.